As the incandescent bad has begun to reach people’s consciousness there are some interesting articles appearing. In the American Thinker on 19 April 2011 Edmund Kontonski has written “The CFL Fraud” identifying a number of issues and includes links to a number of stories where CFLi have caused domestic fires. This is an ongoing proble in the USA as there is twice as much curent in lamps running at 120 V as opposed to 230V in Europe. There are a lot more recessed and enclosed fittings all of which create conditions for overheating. He goes on to address Mercury, slow start up, light loss over life, heat replacement factor, UV emissions, waste and recycling, incompatibility with dimmers, basically all the stuff we have been talking about for the last several years! In the Wall Street Journal on January 19, 20ll Rebecca Smith has written “New Lightbulbs Lose a Little Shine” discussing the failure of the subsides for CFLi to met the requirements set out to deliver energy savings. Again From Germany there are now some serious concerns about outgasing from the materials in these lamps. On Monday the NDR consumer program “Market” ran a item on this. Peter Braun, an expert in indoor air pollutants said “It is particularly concerning that all the investigated lamps outgascancer-causing substances in use,” These include many known carcinogens including Phenol. The transfer path of the substances is not clear, they may come from adhesives and components within the lamps. A manufacturer when questioned responded “neither the nature of the substances nor their concentration exceeds the specified limits.” However these substances must be minimised or excluded from the home or workplace as event the tiniest concentrations can cause cancer. In general we are being advised to seal up our houses in efforts to reduce energy consumption from heating and cooling. This obviously reduces the air changes thus increasing the concentration of any atmospheric nasties such as the products of outgasing. While German consumer organisations and journalists are taking all these things seriously and investigating the problems with CFLi the rest of Europe has their heads firmly buried in the sand. They are totally ignoring the potential future problems being created by widespread use of these so called “energy saving” lamps. As of April 1, 2011 ( This is no joke!) the energy suppliers’ subsidies of CFLi “energy saver” lamps in the UK is ended. As predicted, because there is no “inefficient” option anymore due to the European legislation, there is no argument to maintain this very suspect practice. Recently there have been some really crazy offers, the pound stores have been offering 4 for £1 and even the supermarkets have had similar priced offers. Today it has all changed. The price for a lamp equal to the 60W Incandescent has been decided between the lamp manufacturers and supermarkets to be £2. 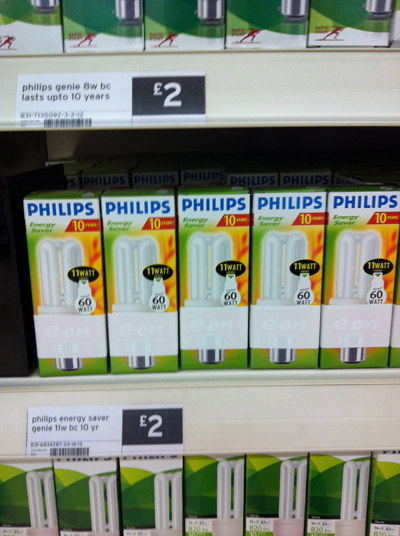 This is the new price for a 11W CFLi and “coincidentally” a 42W halogen energy saver costs £1.98 in the same supermarket. It seems that this is the price point that has been decided as there is no way that I can accept that two such different products whose only common factor is the amount of light produced could realistically cost exactly the same, particularly as TH lamps are also available in the Pound store! So the manufacturers and supermarkets have achieved their aim of getting rid of a low price low profit product , the incandescent lamp, and replacing it with a much higher priced item that, incidentally, is substantially less good.